I’ve always liked the Norse myths, and also the Icelandic Sagas, which were written in the Middle Ages by the descendents of Vikings. The Sagas are interesting because they mix realistic stories about farms and families with sudden bits of supernatural stuff, featuring ghosts and trolls. The fantasy never takes over, but it never goes away either: it’s taken for granted by everyone as something on the margin of their lives. 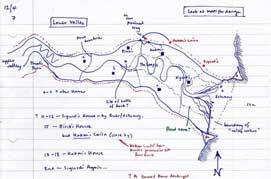 In 2006, after finishing the first three Bartimaeus books, I started thinking about developing a saga of my own. In May that year I did a book tour in New Zealand. I had a couple of days off in the Southern Alps, and sat around looking at the scenery. I began making notes right then about a story set amid vast mountains. Writing a novel is like a heroic quest: it’s a journey full of set-backs and struggles, and you never know how it’s going to end. It took a long time for me to figure out how my saga was going to work. 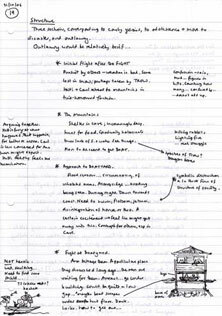 To help figure things out I made many pages of notes, as well as maps and diagrams to flesh out the world I was creating. I worked on the story for more than a year and a half. 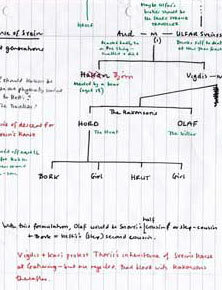 For a long time there were three main characters – Halli, Aud, and a boy called Einar. There was a problem, however. The story didn’t work, and I couldn’t figure out why. Then, one night, I woke up knowing the answer. Einar was the problem. He didn’t add anything to the story, but only slowed it down. He had to go. This was good, but it meant I had to rewrite the whole thing over again. 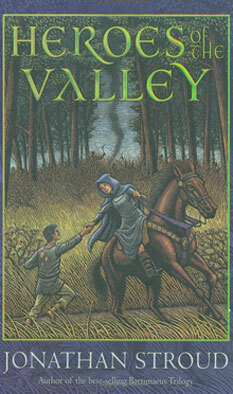 I finished Heroes of the Valley in the summer of 2008. It had taken longer to create than any of my previous novels, but I was very proud of the result. paperback cover follows the German edition. I wrote lots of things that never made it to the finished book. Click below for two lost sequences. Hetti and Krom: My first bit of writing for the book. Halli in the Grave Mound: An entire rejected chapter.